Beau’s Brewery’s annual winter beer celebration “feBREWary” is back for 2016, with weekend events all month long at the Vankleek Hill, ON brewery and a brand-new Beau’s beer tapped each week at participating restaurants and pubs in Ontario and Québec. Festivities kick off February 4 for the fifth annual edition of feBREWary, and continue into early March. On sale today through Groupon and Tuango are a limited number of brewery-bound bus trip packages for each weekend in feBREWary: departures are from Montréal and Ottawa, both Saturday and Sunday, and the package cost is $10 per person. Each package includes round trip bus transportation to and from Beau’s Brewery, a brewery tour with beer samples, and a Beau’s gift. · Feb. 6/7: Tyrannosaurus Gruit, a red gruit brewed for International Gruit Day! Made with organic beets, hibiscus flowers, juniper berries and spruce tips. · Feb. 13/14: Embittermint IPA, an India Pale Ale that blends delicate and floral characteristics of select hops with organic spearmint and peppermint. · Feb. 20/21: Farm Table: Pils North German Style Pilsner, a traditional pilsner with the snappy, bracing hop character typical in Northern Germany. · Feb. 27/28: Elephant Monsoon, a “PB & Grape” Porter ale that gets a fun, flavourful twist with the addition of organic peanut butter and Concord grape juice. · Mar. 5/6: Koru, a Belgian-style ale with spicy, peppery yeast notes, tropical fruit inflections from New Zealand hops, and a pleasantly dry finish. In addition to onsite celebrations, each of these new beers will be tapped weekly at more than 150 restaurants and pubs participating in Beau’s feBREWary. Each new beer will also be sold in 600 ml bottles from the brewery as well as through Ottawa home beer delivery service BYBO (www.bybo.ca). A number of satellite events in both Ontario and Québec will feature the Beau’s feBREWary beers, including the Richmond Hill Winter Carnival, the Toronto Brewfest, and more. feBREWary 2016 will again be raising funds from the sale of glassware at the brewery, in memory of Bryce Elder, a special friend of the Beauchesne family. "Bryce Day" fundraising in 2014 and 2015 totaled more than $8,600; 2016 funds raised will be donated to the Leukemia and Lymphoma Society of Canada. 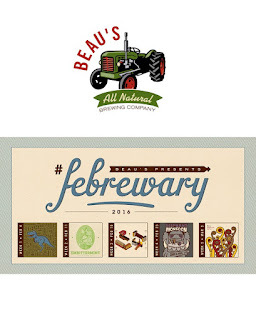 More details about Beau’s month-long feBREWary celebrations (including where to find the feBREWary beers on tap and by the bottle in Ontario and Québec) will continue to be updated at www.beaus.ca/febrewary.